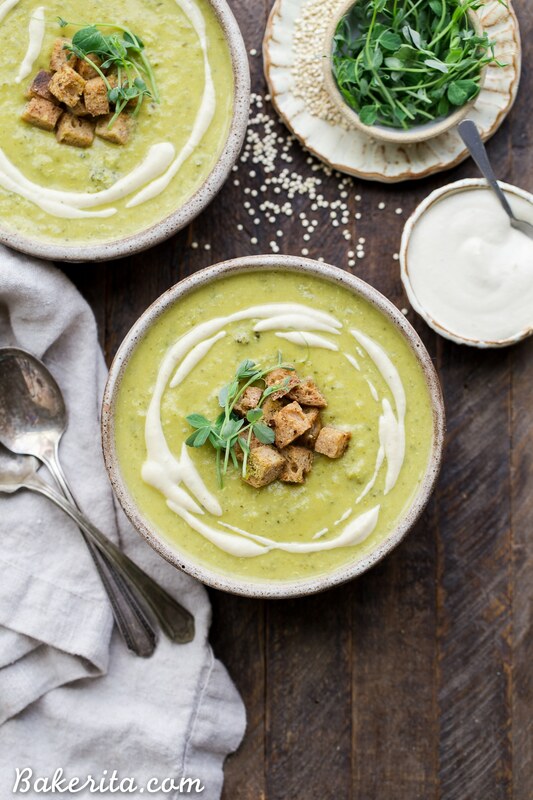 We thicken this Creamy Broccoli Quinoa Soup with cashews and swirl it with an easy cashew cream sauce. It’s rich and filling thanks to the quinoa and cashews and bright from a squeeze of fresh lemon juice. 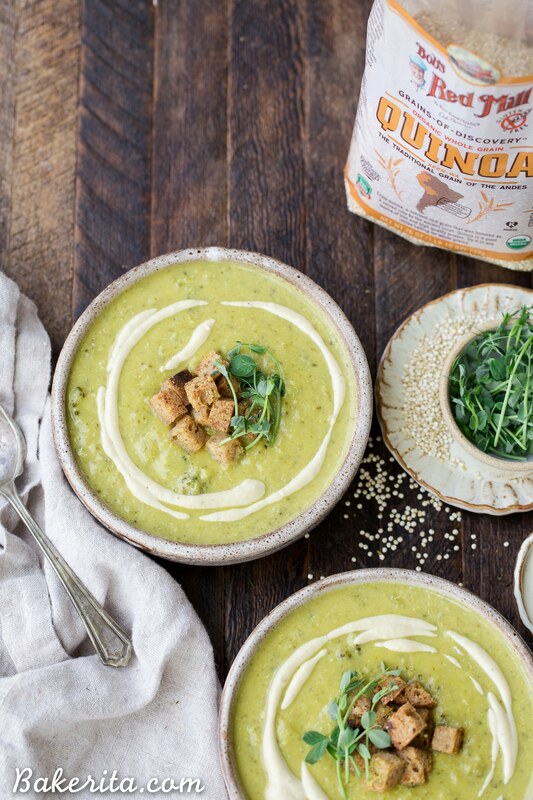 You’ll love this gluten-free and vegan soup on these chillier days! This post is sponsored by Bob’s Red Mill. Back with more savory goodness! In all honesty…soups are one of my favorite savory things to make, hence why there are more soup and chili recipes on my site than any other type of savory food. This classic recipe for my Best Chili and the Paleo Chili version are two of my most popular recipes…and the White Bean Vegan Chili and Red Lentil Soup aren’t too far behind. They’re all hearty + delicious favorites. You’d think by the number of soup recipes I have I actually lived somewhere cold  but nah, this San Diego girl is just a big fan of warm, hearty soup bowls (even on hot days). 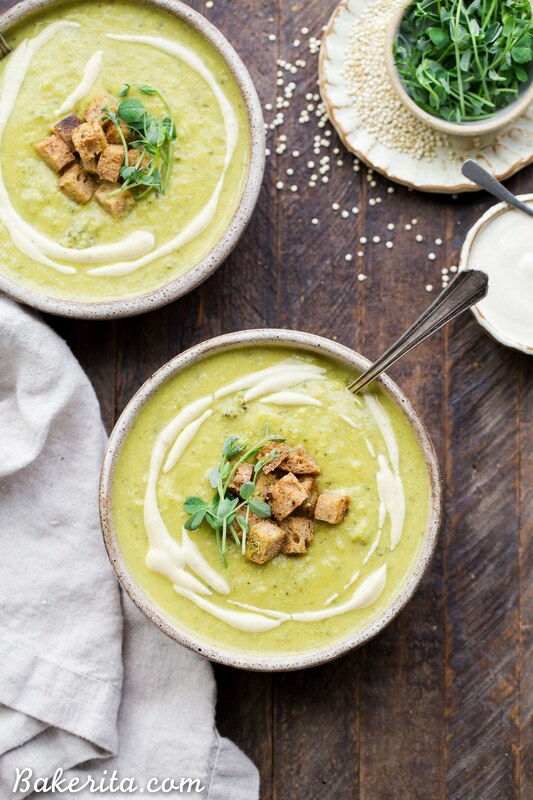 This Creamy Broccoli Quinoa Soup with Cashew Cream checks all my soup boxes: thick, rich, filling, and super flavorful, with a little brightness from some sort of acid. I used lemon juice here. It doesn’t take more than about 40 minutes to make either, which is another win. The cashew cream is also super simple to make and is the perfect creamy garnish…especially when paired with those super simple sourdough croutons. Mmmm…so yum. I’m glad I still have leftovers. 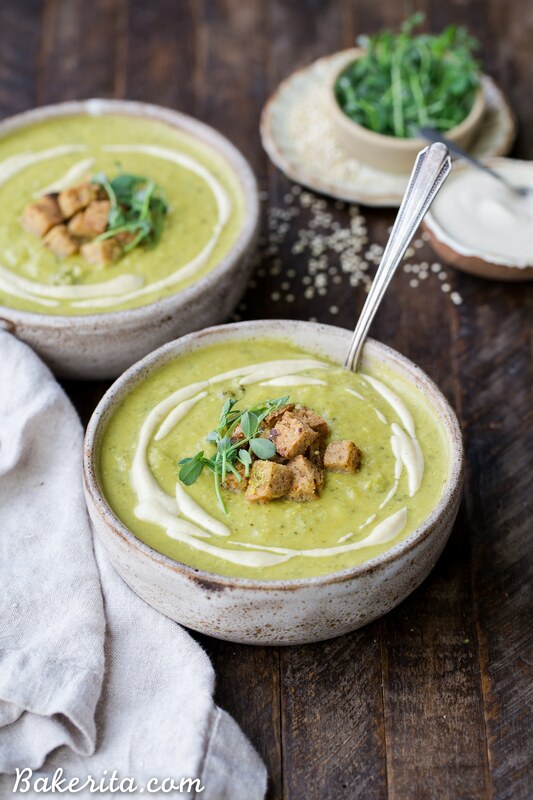 Who wants of bowl of this Creamy Broccoli Quinoa Soup?! The soup is pretty quick and easy to make. If you’ve made soup before, the steps probably seem pretty familiar. It’s well timed too. In the five minutes where the broccoli is simmering, you can put the croutons in the oven. While it thickens at the end, you can whip up the cashew cream. It gets its creaminess from soaked cashews. They aren’t just in the cashew cream but also blended into the soup mixture. This makes it taste like it’s got cream in it, which it, of course, DOES NOT. This Creamy Broccoli Quinoa Soup is thickened with cashews and swirled with an easy cashew cream sauce. It's rich and filling thanks to the quinoa and cashews and bright from a squeeze of fresh lemon juice. 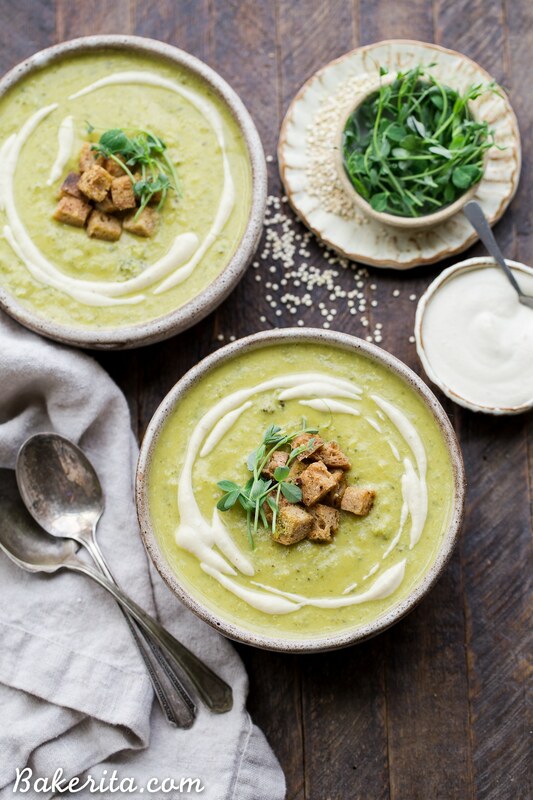 You'll love this gluten-free and vegan soup on these chillier days! In a large saucepan or soup pot, heat the oil over medium heat. Add the diced onion and cook for 5-7 minutes, or until translucent. Add the garlic and cook for one more minute, or until fragrant. Add the vegetable broth and bring to a boil. Add in the broccoli, salt, garlic powder, onion powder, and turmeric and cook for 5-7 minutes or until the broccoli is tender. Remove a heaping cup of the cooked broccoli from the liquid with a slotted spoon and place in a separate bowl for now. Put 1/2 cup soaked cashews, nutritional yeast, and tapioca starch in a high-powered blender (I used my Vitamix) and add the soup from the saucepan. Blend until smooth. You may need to blend in two batches if your blender is on the smaller side. Alternatively, you can use an immersion blender. Add in the broccoli you had removed and the cooked quinoa. Pulse slightly just to break up the broccoli slightly (don’t blend it in completely if you want some texture, like I prefer) and incorporate the quinoa. Return to the saucepan and bring to a simmer to let the tapioca flour thicken the soup slightly. You can simmer for up 5-10 minutes longer, uncovered, if you’d like it thicker. Remove from heat, stir in the juice of one lemon, and serve with cashew cream, sourdough croutons, and microgreens! Blend the soaked cashews with the filtered water, lemon juice, and kosher salt until completely smooth. Add salt to taste. Preheat the oven to 375°F and line a baking sheet with parchment paper or a silicone baking liner. Cut the bread into 1/2-inch cubes. Place in a bowl and toss with the oil, salt, and garlic powder. Place on the prepared baking sheet and cook for 10-15 minutes, or until toasted to your desired crunchiness. You can soak the cashews all together, no need to soak them separately. You can also pour boiling water over them and soak for just an hour or so, if you’re short on time. Wondering if there is nutritional information for the broccoli quinoa soup? Wondering if it’s necessary to cook the quinoa first or if you can cook it right there in the soup. You could probably cook it in the soup, but it will absorb some of the liquid so you’d likely want to add some extra broth or water.